Every year I give my closest girlfriends and sisters paper purse cards for their birthday. It is kind of my little tradition. Inside I include a note or gift card. I find these gifts to be fun to make. What girl can resist a purse even if it’s not a real purse? This year I wanted to make a faux leather paper purse card. A little edgy, compared to the cutesy type purses I’ve made in the past. 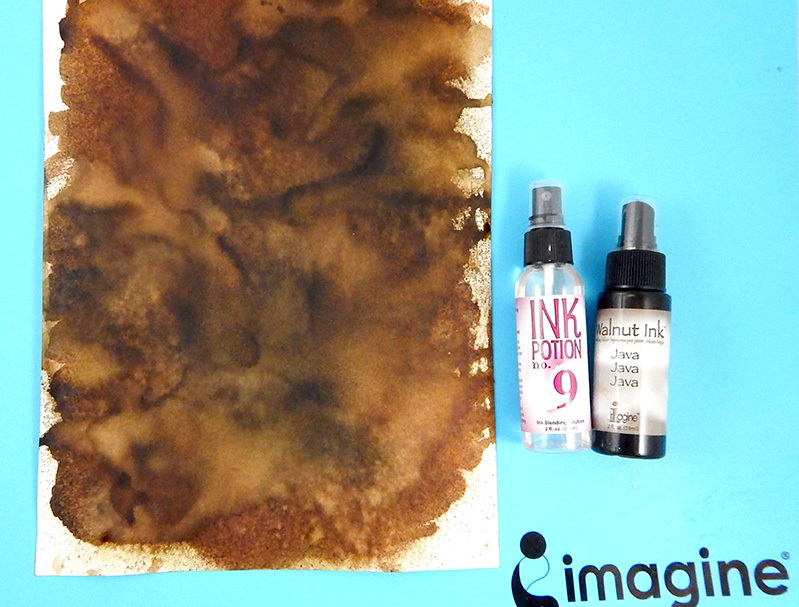 I’ve been having so much fun with Imagine’s Walnut Inks, so I thought I’d try doing a faux leather and I was very happy with the results. See how I did it! Spray the Walnut Ink in Eucalyptus. 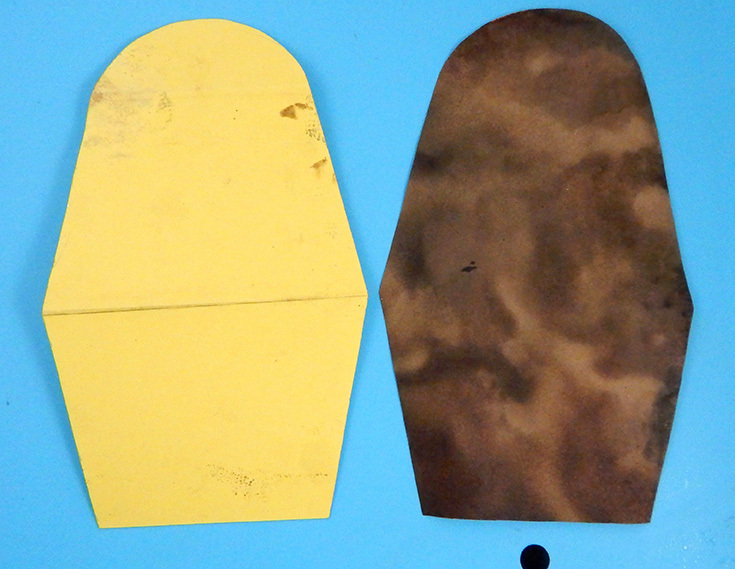 Dry paper. Spray the Walnut (original color) ink, then spray the Ink Potion No.9. The Ink Potion No. 9 blends the inks very nicely and effortlessly. Let dry. 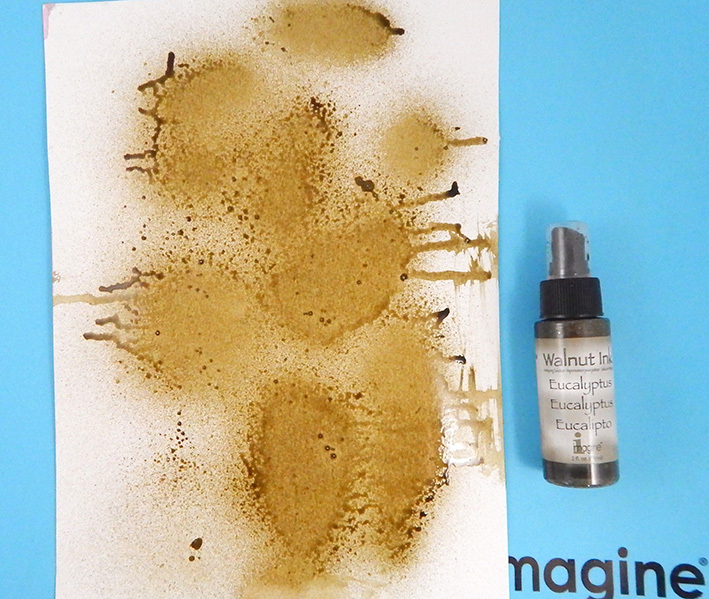 Spray a tiny amount of Walnut Ink in Java in random areas. This ink is intense, a little goes a long way. Spray the Ink Potion No.9 and let dry. 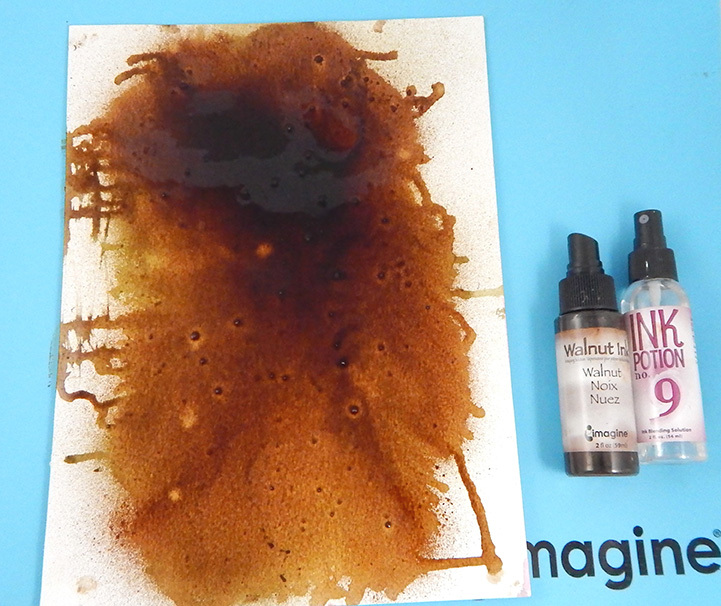 Using all the different hues of the Walnut Inks will create a lovely organic look. Draw or print out a purse template and cut your inked paper using template..
For this step, I found it easiest to do one fold at a time. Stamp VersaMark ink, add Embossing Powder in Clear and remove the excess powder. 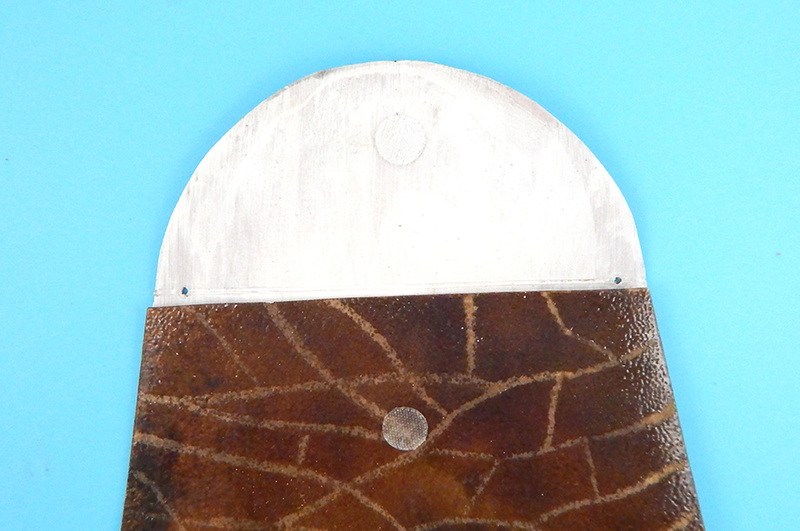 Using the tapered tip Doodlestix, rewmove lines to make the leather looking texture. The Embossing Powder will make the paper surface about 2 shades darker which goes further to encourage the worn leather look. 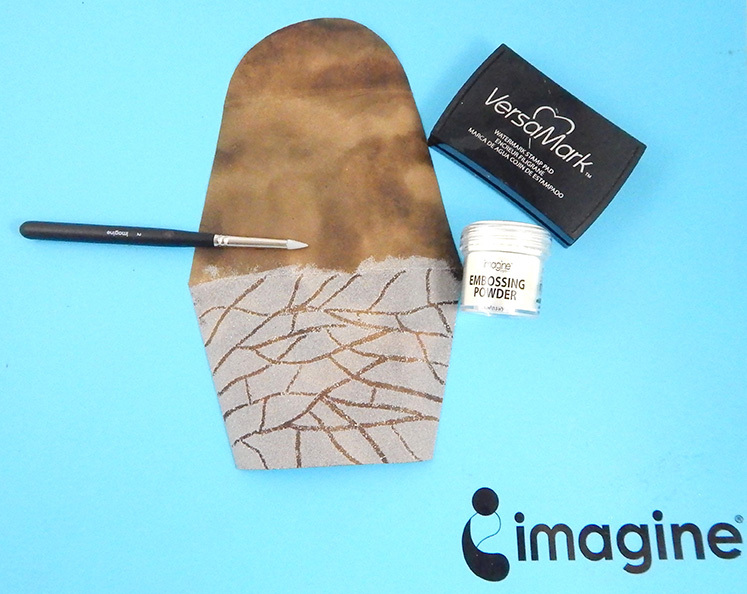 With a Brushstix, add VersaMark to the metal embellishment and emboss with Embossing Powder in Gold. 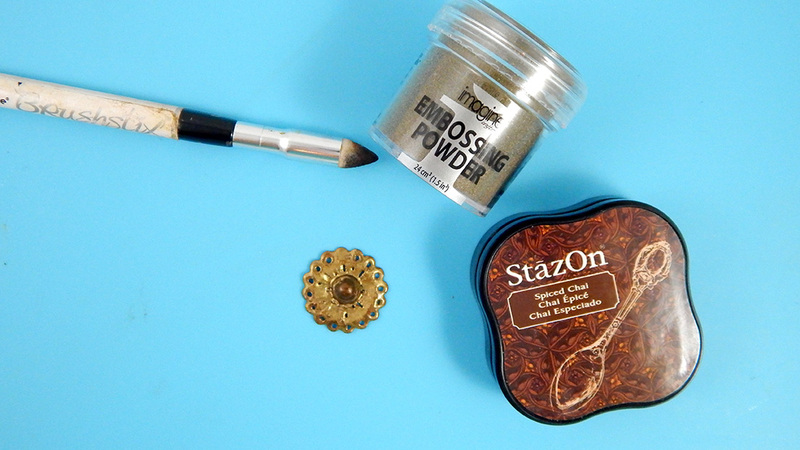 Rub on StazOn ink in Spiced Chai using the brush tip Brushstix which helps to get into the crevices carved out by the DoodleStix. Heat again with a heat tool to fuse the ink with the Embossing Powder. 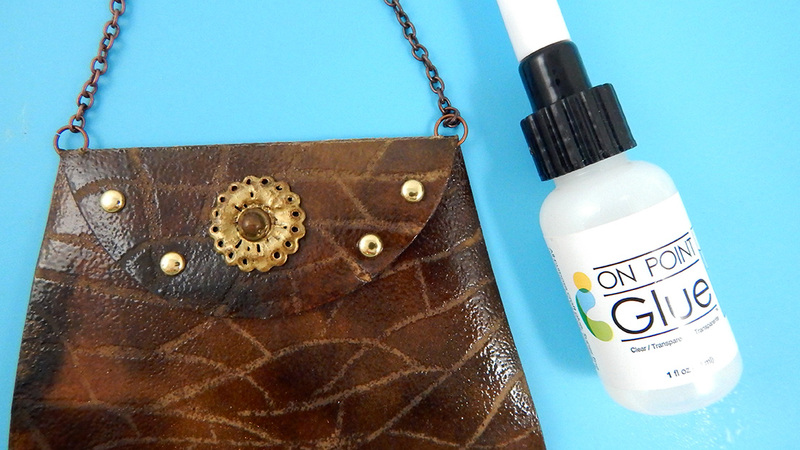 Glue the embellishments and studs to the front flap with the On Point Glue. In order to keep the flap closed, adhere a Velcro dot. Write a “Happy Birthday” note on the inside if you desire. Punch out a hole in the folding area of the flap. 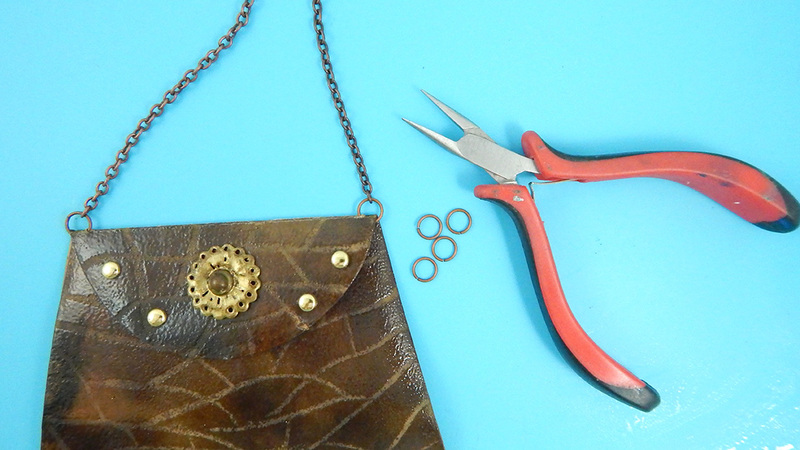 Attach the chain to jump rings and attach the jump rings to the purse. You can stop here or continue adding details to this little gift as you see fit! 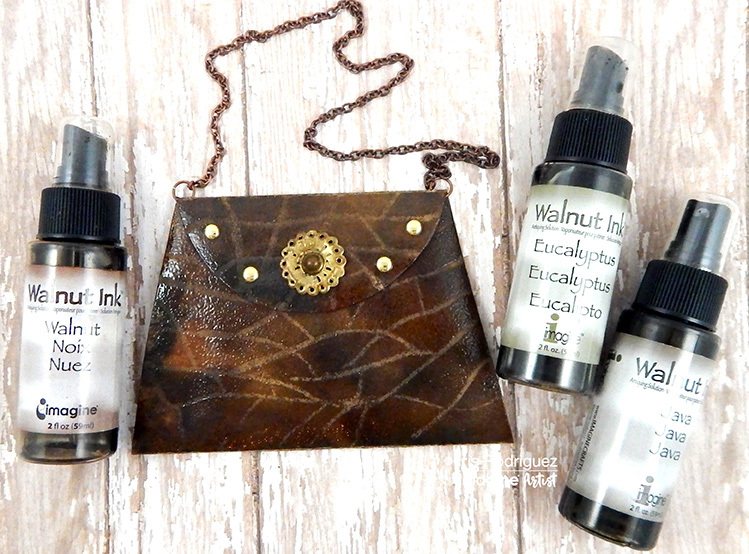 This entry was posted in 2018 ARTIST IN RESIDENCE, DIFFICULTY LEVEL, DIY, Embossing, Gift, INSPIRATION, Intermediate, Iris Rodriguez, Mixed Media, PROJECTS, Techniques and tagged DIY, DIY Inspiration, Handmade, On Point Glue, purse, StazOn, VersaFine, VersaMark, Walnut Ink. Bookmark the permalink.